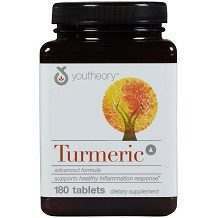 YouTheory Turmeric is a turmeric extract-based product that supports healthy inflammatory response. Its main active ingredients is widely revered, especially in Asia, for its health benefits. The dietary supplement is believed to boost your immune system and make your skin look healthier. 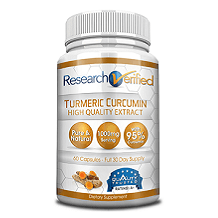 Its manufacturer says it is the most researched turmeric product on the market. Are you considering buying this product? You are likely going to find it beneficial to read our YouTheory Turmeric review before going ahead. The proprietary turmeric extract known as Curcumin C3 Complex is the main ingredient. It boasts a 95% concentration of curcuminoids and is said to have strong antioxidant properties. The efficacy of the product is enhanced by a patented black pepper extract known as BioPerine. This is said to significantly boost the bioavailability of the supplement’s curcuminoids in the bloodstream. The recommended serving is three tablets per day with food and plenty of water. The maker says all three tablets may be taken at once or in divided doses. This appears to be a safe product. We didn’t see any mention of side effects while researching for this review. Pregnant women are advised to speak with a doctor before buying this product. You should also do the same if you have underlying medical conditions. How much you get to pay for Turmeric depends on the number of tablets in the package. The price ranges mostly between $19 and $35. The price of a bottle with 120 tablets was $18.99 on Amazon at the time of this review. This comes to about $0.16 per tablet. We didn’t find any information on availability of a money-back guarantee when researching this review. The official YouTheory Turmeric page does not offer much information about the supplement anyway. It is not a good sign at all when products do not come with offer of a refund. You just have to hope it works – otherwise, you are out of luck. Turmeric is a decent product for shoring up healthy inflammatory response. The combination of the compound curcumin and black pepper extract makes it look like one that can be effective. The lack of a money back guarantee is of concern for a health supplement, though. We also feel the information provided by YouTheory on this supplement is rather insufficient. Turmeric is produced in a facility that is also used for whey milk protein and fish extract processing. This may be a problem for those sensitive to these food items.